Kevin Folsom passed for 215 yards and two touchdowns as Wichita Northwest routed Wichita Southeast 48-7. Folsom connected with Karol Williams four times for 97 yards and a score. Folsom also rushed for 98 yards and three scores, while KeShaun McGaugh added 90 yards and two scores on the ground. Derby built a 35-7 before holding off Hutchinson 35-28. The Salthawks rallied for three fourth-quarter scores pull within the final margin with just over two minutes remaining. Curtis Whitten rushed for nearly 100 yards and scored three touchdowns to lead Derby. Hutchinson’s Blaik Middleton rushed for 156 yards on the night and Turner Wintz rushed for a pair of scores and passed for another. After trailing 7-0 early, Washburn Rural scored the final 51 points during a 51-7 rout of Topeka West. Texas State-commit Blake Peterson passed for 342 yards and three touchdowns to lead the Junior Blues. Rural tallied more than 635 yards of total offense on the night. Jake Michalski and Drew Lewis each had 100-yard receiving nights for Washburn Rural. Connor Lungwitz passes for 230 yards and three touchdowns as Maize outscored Haysville Campus 49-30. Kendall Stewart caught five passes for 95 yards and two touchdowns to lead the Eagles. Freshman Dalyn Johnson led maize with 103 yards rushing and two scores. Colt quarterback John Becker threw the ball 51 times completing 29 for 310 yards and three scores. The Leavenworth Pioneers spoiled Lawrence Free State’s homecoming with a 35-21 upset win. The Pioneers rushed for 141 yards and a touchdown and senior Juwan Potts returned a punt for another score to highlight the win. The Salina Central Mustangs scored the final 30-points in a 37-15 win over Goddard-Eisenhower on Friday night. Despite being down 9-7 at halftime, the Mustangs overcame its slow first half and outscored the Tigers 30-6 the rest of the way to preserve the win. Dalton Peters led Salina Central in the win with 266 yards and three touchdowns on 36 carries. The stat of the night: 423 total yards by Salina Central, all gained on the ground. Wellington improved to 4-0 with a 47-7 win over Clearwater. Crusader quarterback Trevor Nance threw for 185 yards and five touchdowns – four coming to Colin Reichenberger who had more than 100 yards receiving. Wellington now must take on 4A-II’s top-ranked Andale Indians in a battle of unbeaten in Week 5. The Paola Panthers avoided its second home loss of the season with a 20-14 win over the Louisburg Wildcats on Friday. Paola quarterback Ryan Gleghorn scored the eventual game-winning touchdown from one yard out with 10 minutes left in the fourth quarter to break the 14-14 tie as the Panther defense held stout the rest of the way. Gleghorn rushed for two touchdowns and threw for another in the win. McPherson and Rose Hill were in for a defensive battle all night, but it was a Bullpup two-point conversion that made the difference. McPherson went on to win 8-7 over the Rockets. McPherson scored the first and its only touchdown of the game on a 41-yard touchdown pass from Kyler Kinnamon to Payton Stephens. The Rockets scored its touchdown on a 12-play 71-yard drive, but elected to kick the PAT instead of going for the two-point conversion. Wichita Trinity trounced Belle Plaine on Friday night 62-0. The Knights put up 34-points in the first quarter and held a 55-0 lead at halftime. Trinity did not have anyone rush over 100 yards but as a team, they combined for 227 yards and six touchdowns. Senior Tyler Burns led the ground attack with 70 yards and three touchdowns. Osawatomie and Iola put on an offensive showcase as the teams combined to score 79-points. Osawatomie gained 484 yards of total offense on way to its 48-31 win over the Iola Mustangs. 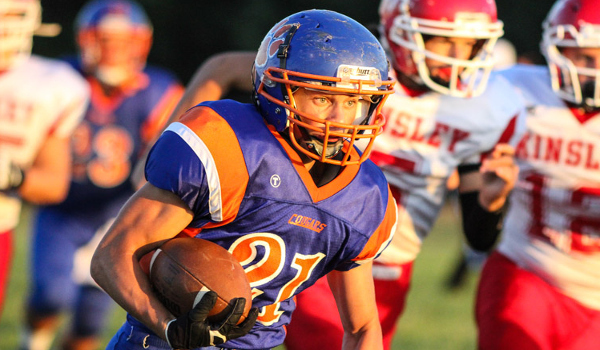 Junior running back Riley England rushed for 312 yards and four touchdowns to lead the way for the Trojans. Larned Indian Evan Skelton intercepted a Nickerson pass with 24 seconds left in regulation to seal the 33-25 win. The Indians rushed for 320 yards, including170 yards from Landon Erway. Erway had two touchdowns on the night, one being a 63-yard scamper to the endzone. Garden Plain rushed for more than 460 yards in beating Wichita Independent 65-19. The Owls led 33-7 at halftime and 45-13 after three quarters. Keynan Wright led Garden Plain with 134 yards rushing and three touchdowns, while quarterback Alex Becker passed for 118 yards and another score. Chad Eikleberry led Independent with eight receptions for 94 yards and a touchdown. Lakin scored in every quarter in racing past Sublette 57-20. Wyatt Burnett rushed for 182 yards and two scores, while Alex Perez added 103 yards and two scores on nine carries for the Broncs. Lakin quarterback Caleb Seeger passed for 119 yards and two touchdowns on the night. Sublette was led by Wyatt Brown’s 142 rushing yards. Council Grove held off Mission Valley 34-26 thanks to a big game from Braden Reddick. Reddick rushed for 140 yards and a touchdown on 27 carries. Trey Langvardt rushed for a touchdown, passed for a touchdown, and caught a touchdown pass for the Braves. Easton Smith passed for 273 yards and five touchdowns as Ellis beat Syracuse 48-6 in a game played at Garden City Community College. The Railroaders’ Sean Lee caught four passes for 135 yards and three touchdowns, while Brendon Brenner added four receptions for 84 yards and a score. Jared Pfeifer rushed for 122 yards and a touchdown for Ellis, and freshman Joseph Eck added 79 yards and a score. Lyndon remained unbeaten by pulling away from Chase County in the second half for a 39-12 win. The Tigers led only 13-12 at halftime, but took advantage of Bulldog turnovers in the second half to pull away with 20 points in the fourth quarter. Daniel Burgess rushed for 158 yards and a score for the Tigers, while quarterback Dawson Swinehart added 150 yards and four scores on the ground. Whitewater-Remington managed only 154 yards of total offense, but it was enough to beat Inman 24-0. The Broncos’ Blake Thunberg passed for 64 yards and threw a touchdown pass to Wyatt Lear. Thunberg also rushed for a score on the night. Lear got the Broncos other touchdown on an interception return. The win was just Remington’s third in the past three seasons. West Elk outscored Lebo 36-28 in the second half to hold on for a 50-34 win. Junior Armando Gomez rushed 37 times for 314 yards and six touchdowns to lead the Patriots. Gomez, a Kpreps All-State selection at running back in 2013, has rushed for 576 yards and 11 scores this season. Braxton Kyle and Clayton Philpott each rushed for a pair of touchdowns as Peabody-Burns shutout Solomon, 46-0. Kyle led the Warriors with 98 yards rushing, while Philpott added 73 yards on the ground. Kyle also connected with Kevin Baatrup on a 51-yard touchdown pass. The Warriors held the Gorillas to 44 yards rushing on 19 carries. Udall led Little River 18-14 after the first quarter, but outscored the Redskins 27-6 the rest of the way for a 45-20 win. Dalton Loos rushed for 108 yards and five touchdowns for the Eagles, while Nolan Williams added 94 yards on the ground and passed for 66 more yards. Otis-Bison outscored Kinsley 104-70 thanks to a 26-6 advantage in the fourth quarter. Sophomore Brad Lightfoot compiled 415 all-purpose yards and scored 10 touchdowns to lead the Cougars. Lightfoot rushed for 278 yards and eight scores, caught a touchdown pass, and had 135 yards in kick returns. Otis-Bison quarterback Kade Urban completed nine of ten passes for 185 yards and four scores. Northern Valley outscored Logan-Palco 20-0 in the third quarter to provide separation as part of a 54-28 Husky win. Phillip Bryant rushed for 75 yards and four touchdowns for Northern Valley, which improved to 4-0 with the win. Carson Wallace led the Huskies with 104 yards rushing and a touchdown. Logan-Palco quarterback Josh Van Laeys passed for 197 yards and a score in the game. Colony-Crest held on to beat St. Paul 28-24 despite being up 20-0 in the first quarter of Friday night’s game. Crest’s Rene Rodriguez scored the three first quarter touchdowns to lead the way for the Lancers. Rodriguez rushing touchdowns came on a 34-yard run, 18-yard run, and a 30-yard run.